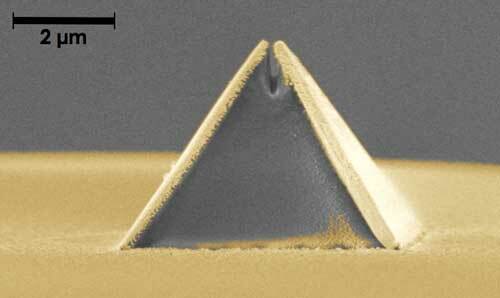 (Nanowerk News) Combining speed with incredible precision, a team of researchers has developed a way to print a nanoscale imaging probe onto the tip of a glass fiber as thin as a human hair, accelerating the production of the promising new device from several per month to several per day. The high-throughput fabrication technique opens the door for the widespread adoption of this and other nano-optical structures, which squeeze and manipulate light in ways that are unachievable by conventional optics. Nano-optics have the potential to be used for imaging, sensing, and spectroscopy, and could help scientists improve solar cells, design better drugs, and make faster semiconductors. A big obstacle to the technology’s commercial use, however, is its time-consuming production process. The new fabrication method, called fiber nanoimprinting, could unplug this bottleneck. It was developed by scientists at the Molecular Foundry, located at the Department of Energy’s Lawrence Berkeley National Laboratory (Berkeley Lab), in partnership with scientists from Hayward, California-based aBeam Technologies. Their research is reported online May 10 in the journal Scientific Reports ("Campanile Near-Field Probes Fabricated by Nanoimprint Lithography on the Facet of an Optical Fiber"). Their work builds on the Campanile probe, which was developed by Molecular Foundry scientists four years ago. Its tapered, four-sided shape resembles the top of the Campanile clock tower on UC Berkeley’s campus. The probe is mounted at the end of an optical fiber, and focuses an intense beam of light onto a much smaller spot than is possible with current optics. This enables spectroscopic imaging at a resolution 100 times greater than conventional spectroscopy, which only maps the average chemical composition of a material. In contrast, the Campanile probe can image the molecule-by-molecule makeup of nanoparticles and other materials. Scientists can use it to examine a nanowire for minute defects, for example, leading to new ways to improve nanowires for use in more efficient solar cells. But fabricating Campanile probes has been part science and part art. The same applies to other nano-optical devices, such as microscopic lenses and beam splitters, which split one light beam into several. These devices require milling a 3-D shape with sub-100-nanometer scale features on the tip of a wispy fiber, which is much trickier than fabricating a nanostructure on a flat surface such as a wafer. That’s where fiber nanoimprinting come in. Its first step is the most time consuming: Scientists create a mold with the precise dimensions of the nano-optical device they want to print. For the Campanile probe, this means a mold of the probe’s nanoscale features, including the four sides and the light-emitting 70-nanometer-wide gap at the pyramid’s top. “This mold can take a few weeks to make, but we only need one, and then we can start printing,” explains Keiko Munechika of aBeam Technologies, which partnered with the Molecular Foundry to develop the fabrication process as part of the Department of Energy’s Small Business Technology Transfer program. Several other aBeam Technologies scientists contributed to this work, including Alexander Koshelev. The company is now commercializing various fiber-based nano-optical devices (see additional information). After the mold is created, it’s off to the races. The mold is filled with a special resin and then positioned atop an optical fiber. Infrared light is sent through the fiber, which enables the scientists to measure the exact alignment of the mold in relation to the fiber. If everything checks out, UV light is sent through the fiber, which hardens the resin. A final metallization step coats the sides of the probe with gold layers. The result is a quickly printed—not meticulously sculpted—Campanile probe. “We can do this over and over and make a probe every few minutes,” says Munechika. There are several advantages to the faster production pace. Campanile probes are fragile, and now it’s possible to give researchers a batch in case one breaks. Plus it’s easier to optimize nano-optical devices if scientists are able to provide feedback on a device’s performance, and an improved batch is quickly developed for further testing. The fabrication technique can also be applied to any nano-optical device, and has so far been used to create Fresnel lenses and beam splitters in addition to the Campanile probe.